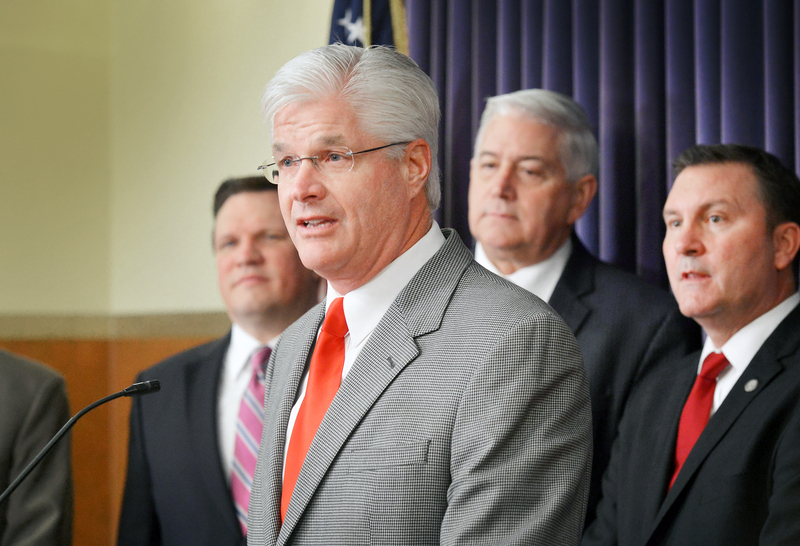 LANSING, Mich. — Sen. Mike Shirkey, R-Clarklake, speaks about reducing unnecessary school regulations at a press conference at the Capitol on Tuesday. Shirkey is the sponsor of Senate Bill 764, which is part of a package of bills requested by local teachers to give them more time to focus on students. Also attending the conference were bill sponsors Sens. Wayne Schmidt, R-Traverse City (left) and Ken Horn, R-Frankenmuth (second from right); and lead sponsor Sen. Phil Pavlov, R-St. Clair Township. Note: Click the image for a print-quality version. This photo and others are also available by clicking the Photowire link, below.